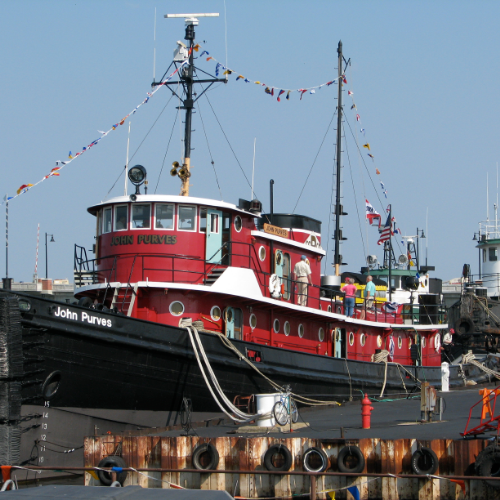 In honor of the 100th anniversary of the tug John Purves, the Door County Maritime Museum is offering a limited number of special Nuts & Bolts tours of the tugboat throughout the summer 2019 season. These small group tours will last approximately 90 minutes and will give guests a chance to learn detail about life aboard the tug and see areas of the historic tugboat not seen on standard tours. Built in 1919 as the Butterfield, the John Purves has been painstakingly restored and outfitted to take visitors back to the days when she was dressed in Roen Steamship Company colors. Explore the entire 149-foot tug, from engine room to crew cabins, galley and wheelhouse, and get a feel for the daily life of her hard-working 13-man crew. At the end of the tour, one person will be selected to sound the tug whistle! These special tours will have a minimum of four people and a maximum of eight participants. Please be advised, this special tour will include ladders and smaller spaces. There are age and height restrictions for children to safely tour the tugboat – they must be at least 4 years old and 38 inches tall. Tickets can be purchased on www.doorcountytickets.com.